The Fitbit Charge HR has spent the entire year at the head of the fitness tracker table – propelling the company to a huge IPO and making it the biggest seller of wearables for the year. No longer the jewel in the Fitbit crown – read our Fitbit Blaze review and Fitbit Alta guide for the latest updates – the Charge HR is a traditional band that offers continuous heart rate monitoring on the wrist for a better estimation of your daily activity, tracked workouts, tabs on your resting heart rate and its improvement as you get fitter and, of course, sleep quality. But does the Fitbit Charge HR live up to rivals, such as Fitbit's own Surge, and what kind of bar does it set for the long awaited Jawbone UP3? We put it through its paces to find out. The Charge HR is available in a range of colours – black, plum, blue, teal and tangerine. The screen matches the colour of the band too, so it doesn't stick out like a sore thumb. Unfortunately the black version is so anonymous it rarely attracts questions or comments – genderless would be a better description than unisex. That screen is a monochrome OLED display and it's fairly vibrant and easy to read, despite being absurdly small. Press the button to cycle though the time, daily steps total, distance travelled, calories, flights climbed and of course your heart rate. The clasp is a normal watch affair, with a standard small buckle and a rubber strap. Now, users initially complained of skin irritation issues, which we reported on last year. Fitbit's response was to urge users to take breaks from their band and to keep it clean. Unfortunately, I followed that advice and still suffered some irritation after bouts of exercise. It's not an problem unique to Fitbit, but this is probably as bad as I've experienced. That said, editor-in-chief Paul suffered no irritation at all, so we'd just recommend that anyone with remotely sensitive skin think carefully before they buy. Other than the mild scabbing, the Fitbit was actually comfortable to wear. It doesn't feel like a set of medieval leg irons, like the Microsoft Band, and it was comfortable enough to sleep with. Advanced tracking is the name of the game, and the Fitbit Charge HR records all the usual statistics, each enriched by heart rate data. It will track your daily steps and calories by day, and monitor your sleep by night. Unlike older Fitbit devices, you don't have to tell it you're planning on snoozing and sleep mode will kick in based on your movements and heart rate data. The Fitbit Charge HR also enables you to track exercise, and by holding the button on the left, you can put the band into 'stopwatch mode,' which means it starts tracking your training sessions – but more on that later. The final feature is caller ID, a sort of smartwatch-lite feature. The band buzzes when someone calls your smartphone, and the name of the caller appears on the screen. There are no other notification features, and while it's useful to check whether a call is important before reaching for your handset, it's not exactly a game changer. The Fitbit Charge HR is 1ATM water-resistant, which is fine for the shower but don't wear it in the bath or a pool. That of course precludes swimming, so if that's your exercise of choice you should look to devices like the Misfit Shine. Like every fitness tracker out there, the Fitbit Charge HR mainly keeps tabs on steps and calories. While tracked steps are never an exact science, over a 14,000 step day the Fitbit recorded in line with both the Garmin Vivosmart HR and the Misfit Shine, so we have no hesitation in giving this aspect a clean bill of health. Now pay attention runners and cyclists: there's no GPS built into the Fitbit Charge HR, which puts it behind the likes of dedicated running watches and its big brother the Fitbit Surge. Without GPS, the tracking of running and cycling is never going to be accurate in terms of distance or pace. An update released since launch means that the Charge HR does estimate distance, although the accuracy left a fair amount to be desired. A 2.1 mile run was guesstimated at 2.56 miles, which meant that the accompanying pace reading was also wrong. To some that's a big problem, to others it's nice to have an estimation of a Sunday run. You decide. With the latest update you don't have to remember to start the stopwatch mode for the Fitbit to track exercise, which is a really nice touch. Any activity, from a brisk walk to the bus, a run or a gym session, will be recorded in the app, and you can tag the exercise type later. It works well and takes the pressure off you to remember to start a session. Exercise tagging is extremely varied and includes spinning, weights, football, hockey, dancing – the lot. When you do head to the gym or out on the roads, you'll get a report of the session showing your heart rate and time spent within zones, calories burned and time taken. The main benefit of the Charge HR, however, is for other activities. While many GPS devices are so focused on running and cycling that they ignore gym work, the Charge HR embraces it, and enables you to get accurate details of your workouts via the optical heart rate monitor that uses a bright LED to 'see' the blood pulsing through your wrist. We tested out the heart rate information both while out running on the roads and when strapped into some of the machines in the gym. 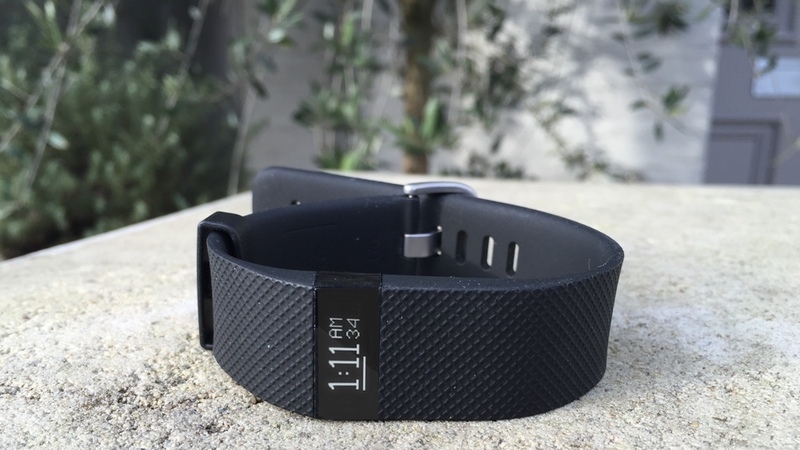 Using gym bikes and weights where we were generally static we found the Fitbit Charge HR's bpm tracking to be spot-on against the machine's own tech, but when running results were fairly wide of the mark compared to a chest strap. That, presumably, is due to the extra 'noise' created when bouncing up and down on the road. The Fitbit Charge HR will also measure your resting heart rate, which is designed to be taken as soon as you wake up. The idea is that as you get fitter the rate of your heart at rest will decrease. It's a great idea – and we love that Fitbit uses this metric – but, worryingly, the data wasn't correct. Our actual resting heart rate (measured via old fashioned pulse and the Garmin Vivosmart HR) was well below 54bpm. The Fitbit had it at over 68bpm in some cases. That's criminally wide of the mark. So what can we conclude? Well, the Fitbit is a decent activity tracker but its heart rate tech really struggles. In terms of features it's pretty much on a par with the Garmin Vivosmart HR, which also struggled to match a chest strap for accuracy, but managed to be a more useful tracker of resting heart rate. Its heart rate tech can inform your workouts but it's far from an effective training tool. As we mentioned, sleep tracking is now performed automatically by the Fitbit Charge HR, which means no more missed nights of sleep. It may surprise some, but Fitbit's sleep reporting is actually way more simplistic and static than any of its direct competitors. The graph shows a blue block, which is your sleep duration. The total time is listed in the app, along with the day's stats. The block isn't coloured to designate hours of deep or light sleep as with other sleep trackers, but there are lines that mark when you toss or turn. It's a remarkably simplistic feature which is surprising for a leader like Fitbit, yet as we've repeatedly said, sleep tracking is one of the least useful elements of fitness trackers. There's very little to learn about your sleep patterns, short of making sure you get your eight hours every day – which the Fitbit is more than capable of. If you're keen to see detailed sleep patterns, the Withings Activité Steel or Misfit Shine will do a better job. While not as in-depth as the Withings Health Mate app, or as open as the Jawbone one, the Fitbit Charge HR's app is clean, simple and easy to use. It's also quick to sync, with no frustrating pairing problems. When you open the app, you're presented with all your data from the day, including steps, heart rate, distance travelled, calories burned, stairs climbed, amount of 'active minutes', bursts of stopwatch captured activity and sleep. There are plenty of metrics to sink your teeth into, and that's without the additional food tracking, food plans and weight tracking options which require manual daily inputs – a step too far for us. Any metric can be tapped to show historical data, as well as weekly totals. That's especially useful for 'active minutes' which is the amount of time spent in the day with your heart rate elevated. Upping this total means you're getting fitter. Delving into the app further will reveal plenty of controls, where you can fine tune the device to your dominant or non-dominant wrist, or turn on the caller ID notifications. You can also challenge yourself to beat certain step goals in the challenges tabs, and even invite friends to participate, too. It's a good idea, although we were disappointed by the choice of goals. Each of the four challenges simply involves walking more, not burning more calories or racking up more active minutes of exercise. Those seem far more meaningful, and thus far, don't exist within the Fitbit app. Given the continuous heart rate monitor flashing away under the device, battery life is impressive. You should be able to get five days easily from the tracker, and we found it easy to keep topped up. Charging is via a proprietary cable that magnetically hooks into the back of the device. Of course, if you lose that cable, you're stuffed, but we're sick of complaining about this seemingly ubiquitous wearables issue, and it's not something confined to the Charge HR. A decent fitness tracker, the Fitbit gives a good indicator of overall health, but don't confuse it for a scientific training assistant. Lack of GPS makes it toothless for runners, but more worryingly issues with heart rate accuracy both during rest and during exercise erode confidence in its results. While the Fitbit blazed a trail for biometric wearables, it now lags behind the competition.